← Links | Where Do I Buy My Books? From the back of the book: Alice Howland is proud of the life she worked so hard to build. At fifty years old, she’s a cognitive psychology professor at Harvard and a world-renowned expert in linguistics with a successful husband and three grown children. When she becomes increasingly disoriented and forgetful, a tragic diagnosis changes her life–and her relationship with her family and the world–forever. Review: This was a heartbreaking book to read. I finished it in one sitting. Each sentence giving me a different emotion. I found my heart aching, then laughing, then sobbing, then smiling. You the reader are brought into the Howland family’s life, more specifically Alice’s and the struggles with early on-set Alzheimer’s disease. It was interesting to see how a well known Harvard linguistics professor dealt with the illness. An illness that would soon take away her own language. Each chapter is a month with the correlating year. Each month you see how the disease has affected Alice and her family. Each month you see her good days and you also see her bad days. Things that used to come so easy to her become such a struggle. I can’t imagine what it feels like to slowly lose your mind and a part of yourself each day. This book reminds you to live for today because who knows what will happen tomorrow. 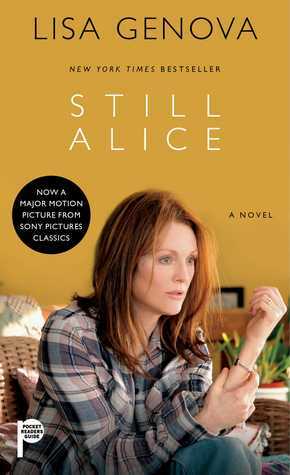 This entry was posted in book, book review, books, lisa genova, review, still alice. Bookmark the permalink.